Can you share your CPV expectations for our pilot campaign? Undeniably one of the most asked questions in the run-up to a TV pilot is “What Cost-per-Visitor (CPV)” or “What Cost-per-Sale (CPS)” should we expect, and “what have you seen in other campaigns?” It is a completely normal and fair question. Even a modest $100K TV pilot is a sizeable bet for most marketing people. Furthermore (and particular in technology circles), TV suffers from a stigma of wasted spend, and therefore gets deeply scrutinized at either the CEO or board level. The answer is unfortunately not straightforward. The idea that companies within a certain industry or product/service vertical all run similar CPVs is flawed. Each company is unique, not just in its TV metrics, but also in its optimizations. 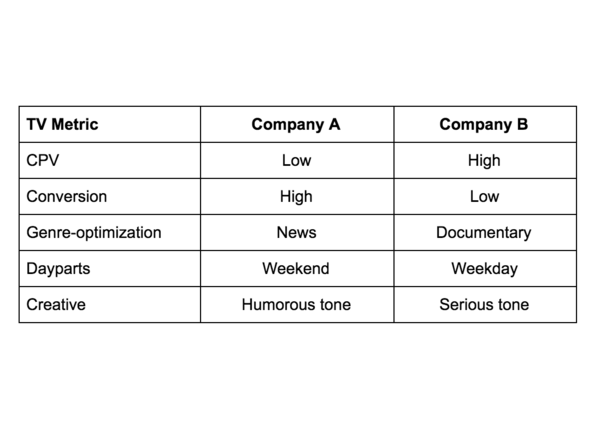 For example, the hypothetical table below may perfectly summarize the core metrics of two competitors (both being successful TV advertisers). The scenario above also counters (traditional agency?) old-school arguments and projections based on “having experience in a vertical or industry” or “representing other clients with a similar product". Whilst CPV projection is difficult, conversion is easier. At Tatari, we typically observe conversion from TV to come in a touch higher than conversion from paid digital (and Facebook prospecting in particular). This may sound counterintuitive at first, but it is not: people who respond to a TV advertisement must go through a little bit more effort. After all, navigating to a website or app (whether by keying in the URL directly, or via a Google search) requires more effort than clicking a link. Furthermore, delayed responders i.e. the people who don’t react to a TV ad within minutes, but instead do so hours or days later, demonstrate higher intent (reflected in the fact that they remember the product or website, well after the airing of the ad). The problem with conversion measurement from TV (see also here) is that it requires more spend and time to measure accurately. Nevertheless, and in a remarkable way, the ability to reasonably project conversion unlocks an opportunity to estimate CPV, or at least, set credible CPV targets very early on. We will explain this further below. As discussed in a prior post, TV and FB (prospecting) are two very similar customer acquisition channels. Furthermore, anecdotal evidence amongst many clients and potential clients have shown that when Facebook prospecting spend hits $300,000 per month, marginal cost escalates (or profitability on the Facebook campaign erodes). Phrased differently (and as explained in this article), for many companies, $300,000 per month on Facebook is a spend-level where TV advertising stands a strong chance of driving customers at a lower, or at least equal, marginal CPS. 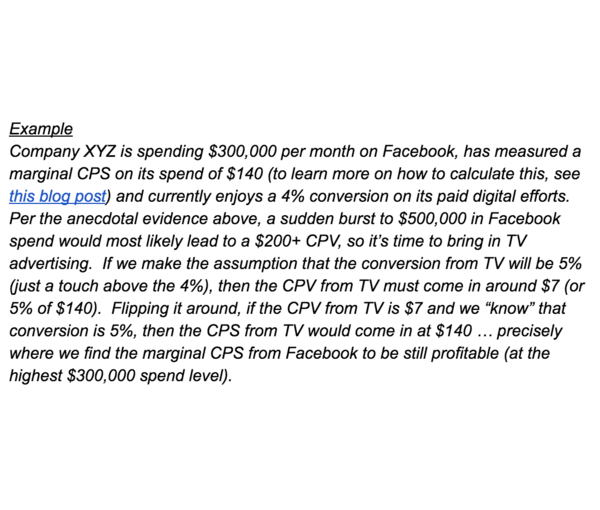 Applying the projected conversion rate to this CPS target leads us to a likely CPV target on the TV campaign, before any money is actually spent. Confidence in a TV pilot can also be found without much mathematical wizardry (or CPV projections). It is often sufficient to just take a look at what competitors, or companies with similar products are doing (assuming they are going after the exact same audiences). If they have been consistently on TV for a number of years, then one may reasonably conclude it is working for them. After all, in their vertical, and over the years and millions of dollars (easily $100million+), TV has earned its place in the optimal mix across platforms. That, combined with the fact that TV is no longer a $1M+ Russian roulette (i.e. it’s possible to start with $100,000), should be enough to earn a CMO’s confidence. As such, the quest for CPV or CPS data prior to launch is possibly unwarranted, and doing the TV pilot (with modest spend) is putting the horse back in front of the cart.